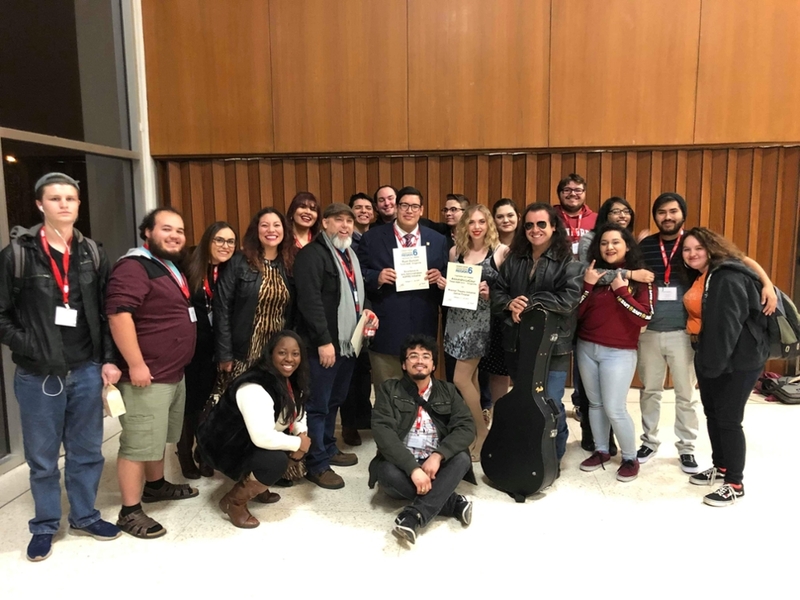 KINGSVILLE (March 22, 2019) — Theatre students and faculty from Texas A&M University-Kingsville were successful at the regional level of the Kennedy Center American College Theatre Festival (KCACTF) in Abilene. Corey Ranson, associate professor of theatre, received the highest honor, the KCACTF Gold Medallion Award. It is given by each of the eight regions to honor individuals or organizations that have made extraordinary contributions to the teaching and producing of theatre and who have significantly dedicated their time, artistry and enthusiasm to the development of the KCACTF. The recipients of the award have demonstrated a strong commitment to the value and goals of KCACTF and to excellence in educational theatre. The Gold Medallion is the most prestigious regional award given by KCACTF and is considered one of the great honors in theatre education. Individually, Ryan Duncan won the Aspire Arts Management Award which provides him with an all-expense paid trip to the national festival in Washington D.C. for a week to participate in an arts management fellowship. Lexi LaCour received the Music Theatre Initiative Finalists Award. The theatre production of June Bugs received an award for supporting new works and a plaque honoring the production. Started in 1969 by Roger L. Stevens, the Kenney Center’s founding chairman, the Kennedy Center American College Theater Festival is a national theater program involving 20,000 students from colleges and universities nationwide annually. For 50 years, the organization has served as a catalyst in improving the quality of college theater in the United States. The goals of the KCACTF are to encourage, recognize and celebrate the finest and most diverse work produced in university and college theater programs; to provide opportunities for participants to develop their theater skills and insight and achieve professionalism; to improve the quality of college and university theater in America; and to encourage colleges and universities to give distinguished productions of new plays, especially those written by students, the classics, revitalized or newly conceived and experimental works. Through state, regional and national festivals, KCACTF student and faculty participants celebrate the creative process and share experiences and insights within the community of theater artists. This KCACTF honors excellence of overall production and offers student artists individual recognition through awards and scholarships in playwriting, acting, dramatic criticism, directing and design.